Ice caves are temporary structures that appear at the edge of glaciers. They look amazingly beautiful from the inside. 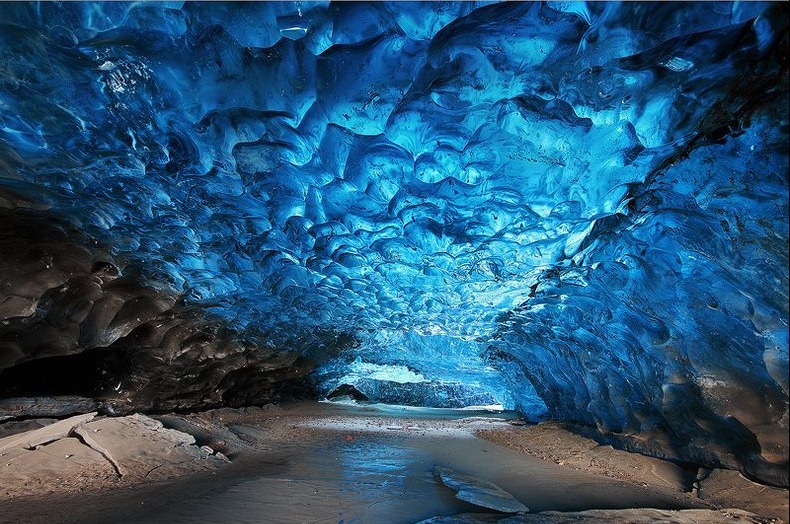 This particular cave is located on the frozen lagoon of the Svínafellsjökull glacier in Skaftafell, Iceland. The centuries old ice coming down the slopes of Öræfajökull via Svínafellsjökull glacier has metamorphosed into highly pressurized glacier ice that contains almost no air bubbles. The lack of air means that it absorbs almost all visible light, apart from the blue fraction which is then visible to the naked eye. However, this blue ice can be seen only under certain circumstances. It can be seen in winter after long periods of rain when the surface layer of the glacier has been washed away. It can be seen in ice-caves like this one and on floating icebergs that have recently rolled over.